We carry Bruno’s Valet Seat and StowAway seat which can be installed in your car, truck or SUV. Either seat can be installed in place of your OEM seat and alleviate the painful turning and twisting required to get into a car seat. 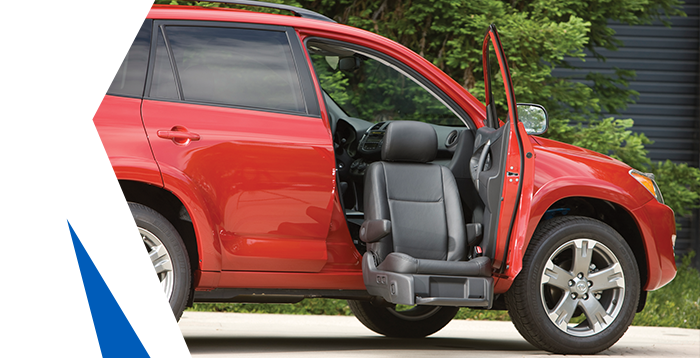 Enter/exit a car or pickup truck easily with a safe transfer from your wheelchair or walker. And as a bonus, when you get ready to trade in your vehicle, just re-install your OEM seat, and bring your Valet Seat or Stowaway back to Kansas Truck Mobility for us to re-install in your new vehicle. Get in and out of higher vehicles effortlessly with Bruno’s Valet Plus – the most versatile of the Valet Signature Seating line. The Valet Plus turning automotive seat is individually dealer pre-programmed to power rotate, extend and lower to an optimal height at the press of a button. Take advantage of therapeutic seat heat and other comfort-enhancing options. It’s time to enjoy running errands and road trips again.